VW Golf Mk4 1998 > 2004 R32 Anniversary Gttdi Gti Aero Wiper Arms & Blades. THESE WILL FIT ALL VW GOLF MK4 AND BORA'S. VW Bora > 2006. SCIROCCO MK3 GT 2.0TDI. SPEED AUTO DSG CODE NJJ. BODY TYPE: 3. All our used parts are in good condition and are tested prior to dispatch. TOP QUALITY CAR PARTS. PART NUMBER MAKE: VOLKSWAGEN. Cash on collection. 1J2955409D 1J2 955 409D. Golf Mk4 2003 - 2006. Bora 2003 - 2005. This is aleft / UK passengers side wiper arm (aero blade type) for the following cars This is a new, genuine part. MANUFACTURER PART NUMBER = 5G2955409. GENUINE 2013-2017 VW MK7 GOLF FRONT WIPER ARM PASSENGER SIDE. DONOR VEHICLE = 25,346 miles 2015 VW Golf mk7 1.4 TSI Match 5 doors Manual 6 speed Hatchback. Fits:-VW Polo Mk4 models from:- 2002 to 2009 with Part Number:- 6Q2955409. For Sale:- VW Polo Wiper Arm & Blade Passenger Side Front. Wing Mirror. We always try our best to help. We're here to help whenever you need us. (Taken from: 2007 VW PASSAT B6 2.0 TDi ENGINE BMR, GEARBOX KDS, GREY LA7T, ESTATE). YOU WILL FIND MORE INFORMATION ABOVE. We are open Mon.-Fri 9:00am - 5:00pm. Sat 9:00am - 2:00pm. FOR SALE IS A USED BUT GOOD USEABLE CONDITION GENUINE PASSENGER SIDE FRONT WIPER ARM TO FIT A 6N OR 6N2 VW POLO. PART NUMBER IS 6N2 955 409. PART NUMBER IS: 5M0 955 410 A 5M0 955 409 A. VW GOLF PLUS 2004-2008 FRONT WIPER ARMS AND BLADES PAIR. Front wiper arms are removed from VW Golf Plus 2006, but it's can be cover 2004-2008. VW POLO 2012. RIGHT SIDE FRONT SCREEN WIPER ARM. We also specialize in used car parts that have already been removed and shelved. WE AIM TO PUT DOWN AS MUCH INFORMATION AS POSSIBLE AND BE ACCURATE AS POSSIBLE IN DESCRIBING THEM ANY PROBLEM WILL BE LISTED OR SHOWN IN PICTURES. MODEL: PASSAT B6 2.0 TDI CR. GEARBOX:6 SPEED MANUAL CODE:KNS. BODY TYPE:5 DOOR ESTATE. ENGINE: 2.0 DIESEL 140 BHP CODE:CBA B. Do not relay on it. Cash only if collected in person! Cost A Fortune New From VW. (Taken from: 2007 VW GOLF MK5 1.9 TDI BXE, BLACK LC9Z, GEARBOX JCR, 5 DOOR, BREAKING) 1C. YOU WILL FIND MORE INFORMATION ABOVE. We are open Mon.-Fri 9:00am - 5:00pm. Sat 9:00am - 2:00pm. Mk5 2004 Fsi. I have loads of parts available. Feel free to message if you need something. Thank you. # 1K8 955 409 A. VW SCIROCCO MK3 - UK RIGHT HAND DRIVE. PASSENGER SIDE AERO WIPER ARM IN GOOD CONDITION. GENUINE PART. Part Origin Part Number. 1K5955409B03C - 1K5 955 409B. Jetta 2006-2011. This is aleft / UK passengers side wiper arm for the following cars GolfEstate (Mk5/6) 2007-2014 (does not fit golf hatchback). This is a new,genuine Volkswagen part. REMOVED FROM:2005 VW GOLF 1.9 TDI 5DR HATCHBACK. PAIR OF WINDSCREEN WIPER ARMS. FOR SALE IS A USED BUT GOOD USEABLE CONDITION GENUINE FRONT WIPER ARM REMOVED FROM A VOLKSWAGEN SCIROCCO MK2. (Taken From: 2005 VW PASSAT B5 1.9 TDI AVB, 5 SPEED GEARBOX GFL, BLUE LC5F, ESTATE) P1. YOU WILL FIND MORE INFORMATION ABOVE. (VW TOUAREG 2006 3.0 V6 TDI PASSENGER SIDE FRONT WIPER ARM. FUEL TYPE:DIESEL. BODY TYPE: 5 DOOR SUV HARDTOP. ENGINE CODE:BKS / CATA. 2) Fault or failure of an ancillary component, for example a radiator, timing belt, water pump, fuel injection system, turbo, coolant, gasket, hoses, etc. PASSAT B6 3C5 2.0 TDI. 6 SPEED MANUAL. BODY TYPE All our used parts are in good condition and are tested prior to dispatch. TOP QUALITY CAR PARTS. PART NUMBER ITEM CONDITION. WINDSCREEN WIPER ARM (PASSENGERS SIDE). VW PASSAT B3 FACELIFT MODEL 2001 - 2006. Part Number : 1K2955409. VW GOLF MK5. Donor Car: VW GOLF MK5 1.9 TDI. PASSENGER SIDE NSF. FRONT LEFT WIPER ARM. Engine Code : BKC. Part is taken out from. for Scottish Highland, Northern Ireland. VW TOURAN 2003. REMOVED FROM A VW TOURAN (2003). PAIR OF FRONT WIPER ARMS. IN GOOD CONDITION AND IN GOOD WORKING ORDER. AB, BT, HS,JE,KA, KW, PA, IM, IV, ZE. 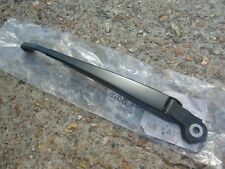 VW Polo MK2 86C Front windscreen wiper arm. Suitable for most MK2 86C Polo's 1981-1990. Our roots are firmly in the water cooled VW, retro cars, Hot rods and grass roots motorsport world. Engine / cylinder head rebuilds. FOR SALE IS A USED BUT GOOD USEABLE CONDITION GENUINE FRONT WIPER ARM REMOVED FROM A VOLKSWAGEN SCIROCCO MK2. PART NUMBER IS 534 955 409. (Taken from : 2007 VW GOLF MK5 2.0TDI BKD, SILVER LA7W, 6SPEED GEARBOX HDV, 5DOOR ). YOU WILL FIND MORE INFORMATION ABOVE. We are open Mon.-Fri 9:00am - 5:00pm. Sat 9:00am - 2:00pm. Will fit Golf mk4, Bora & Audi a3 8L models. VW GOLF MK4 WINDSCREEN WIPER ARM. For right hand drive models only. USED CONDITION. However all marks considered bigger than normal wear will be listed. (Taken from : 2007 VW GOLF MK5 2.0TDI BKD, SILVER LA7W, 6SPEED GEARBOX HDV, 5DOOR ). YOU WILL FIND MORE INFORMATION ABOVE. All parts are used, fully tested and are in fully working order, unless stated in the title. PASSAT B7 362 2.0 TDI BLUEMOTION. COLOUR: DEEP. 6 SPEED MANUAL. BODY TYPE: 4. All our used parts are in good condition and are tested prior to dispatch. TOP QUALITY CAR PARTS. PART NUMBER Cash on collection. RIGHT SIDE WINDSCREEN WIPER ARM. VW GOLF 2.0 TDI 2011. We also specialise in used car parts that have already been removed and shelved. WE AIM TO PUT DOWN AS MUCH INFORMATION AS POSSIBLE AND BE ACCURATE AS POSSIBLE IN DESCRIBING THEM ANY PROBLEM WILL BE LISTED OR SHOWN IN PICTURES. 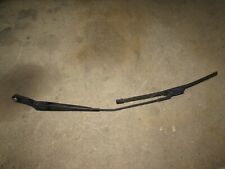 FOR SALE IS A USED BUT GOOD USABLE CONDITION GENUINE PASSENGER SIDE FRONT WIPER ARM REMOVED FROM A VOLKSWAGEN PASSAT B4. PART NUMBER IS 3A2 955 409. PASSAT B6 3C2 2.0 TDI. COLOUR: MOCHA BROWN CODE LC8Z. 6 SPEED MANUAL. BODY TYPE All our used parts are in good condition and are tested prior to dispatch. TOP QUALITY CAR PARTS. PART NUMBER ITEM CONDITION. MODEL: PASSAT B6 1.9 TDI. GEARBOX: 5 SPEED MANUAL CODE:JCX. BODY TYPE:4DOOR SALOON. ENGINE: 1.9 DIESEL 105 BHP CODE: BXE. Do not relay on it. Cash only if collected in person! Golf GT TDI (MK5 (A5) (1K)) (ABS). Pair of Front Wiper Arms. Electric Front & Rear Windows, Electric Door/Wing Mirrors. The table below contains further information. Manufactured Year. This item is a used vehicle part and as such may have signs of general wear/handling. PASSAT B6 3C2 2.0 TDI SE. 6 SPEED MANUAL. BODY TYPE: 4. All our used parts are in good condition and are tested prior to dispatch. TOP QUALITY CAR PARTS. PART NUMBER DOOR, SALOON. ITEM CONDITION. VW GOLF - MK6. A PAIR OF FRONT WIPER ARMS COMPLETE WITH BLADES FOR PASSENGER DRIVERS SIDE. Part Number : N/A. FOR SALE IS A USED BUT GOOD USEABLE CONDITION GENUINE NEARSIDE FRONT (PASSENGER) WINDSCREEN WIPER ARM REMOVED FROM A 1999 VOLKSWAGEN SHARAN. IT CAN BE FOUND ON THE BACK OF THE WIPER ARM AS SHOWN IN PIC. REMOVED FROM: 2004 1.9 TDI SKODA OCTAVIA ELEGANCE 5 DR HB 130HP. PAIR OF WIPER ARMS-BLADES NEED REPLACING. LEFT SIDE WINDSCREEN WIPER ARM. VW GOLF 2.0 TDI 2011. We also specialise in used car parts that have already been removed and shelved. (WILL FIT MODELS FROM 2009-2012). THAT HAS BEEN REMOVED FROM A.
Jetta 2005 / 06 models only . This is a new,genuine VW part. Part number. Alternative part numbers. PART NUMBER IS: 1K2955410 1K2955409. VW GOLF MK5 2004-2008 FRONT WIPER ARMS PAIR. Wiper arms are removed from VW Golf Mk5 2005, but it's can be cover 2004-2008. (FIRST TO SEE IF YOU ARE HAPPY TO RECEIVE IN SUCH CONDITION). PART CONDITION IS. We try our best to make sure that you receive the item as you have expected it to be. In such a case. EVERY PART TAKEN OUT OF THE VEHICLE HAS BEEN TESTED.